Cloud is a sofa concept designed for ultra comfort and relaxation. The soft floating upper part is supported by the magnetic force generated by the bottom base. 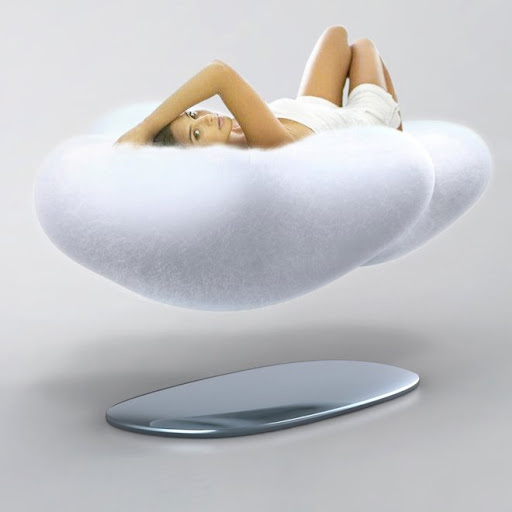 No matter if you want to work and sit with comfort or simply a power nap to release the stress, you can always enjoy your time to relax on the floating cloud. It's a incredibly powerful magnet, accidentally tilt the sofa too much, and it'll turn 180 degrees, attach and crush the person, no way someone survives between those two magnets. A full scale version of this is probably impossible at any price. It is definitely impossible at any reasonable price. It would require superconducting coils and a huge amount of electrical power, or incredibly powerfull permanent magents with electromagnets to stabilise it. Either way, a malfunction could easily be fatal. I'd rather lay on several crades of dynamite - it would be much safer. sorry - this is really stupid. It can't work. Commenter David Koo mentions science fiction, which is funny because this idea is a rip-off from a Kurt Vonnegut novel, "Sirens of Titan", where there is a office with all floating furniture powered by magnets. This is definitely science fiction. Also, it's not a very original idea, or very inspiring. It seems mostly decadent. Thanks Matthew for your sharing. Fortunately enough, the Cloud is presented in a more matured level - aesthetically appealing with suggested object structures, which makes it interesting enough to touch people than barely words. I see a couple comments about the stability of such a concept as well as the requirements to make something like this work. It looks like some people are holding firm to Earnshaw's theorem, without completely understanding all possible aspects. A number of people could learn some fun little tricks from Theo Gray. He would also likely explain that one exception to this problem is diamagnetism which is a purely repulsive force as opposed to ferromagnetism (common North/South pole type). I don't want to plagarize Theo's work or book which I paid money for and feel he earned it for his efforts, but check him out at www.graysci.com and you might pick up a few other tricks to entertain yourselves. The biggest trick I can see to this furniture concept would be to keep it from floating away from the base and dropping to the floor due to a lack of friction to keep it in place. until there are technological advances to filter out where we would like to apply magnetic forces, this will not be possible. Its fine and dandy to just create a concept, and from this post DK you haven't given any of us readers assurance that this would ever be possible. To me at this moment it just suggests that this is as conceptual as an artists illustration. and interesting to see someone else having this idea. I made some sketches years ago with magnetically held upholstery that supported the limbs of the body individually. This makes me think about all those floating platforms i've seen in games. Now I'm excited for it! I sure hope someone works on this technology for the future! What's the secret for it? I need to know if there's a way of do something like this with some acrylic stuff for holding the cloud and the base togheter. That would be amazing to buy, but as other commenters state, it would be highly dangerous if it were to flip over while you were in it... ouch. Just out of interest, if it was safe and actually POSSIBLE, how long would it take for it to be sold, and what would the price range be? We'd like to feature the Cloud Sofa for an exibition in Paris. Therefor, I would need the hi-res pictures. Your name and website would of course be credited, as well as photo credit. I'm an editor of the magazine 'D.nomade'. We're making design concept magazine in South Korea. For the next issue, I searched web-sites and found your work (Cloud Magnetic floating sofa). I'm impressed this design! So, If possible, can I introduce your work with photos? And can I have the hi res photo? Please visit and answer me ASAP. you know what you do? a spinning mechanism in the head and foot section creating a gyroscope so overtilt is nearly impossible. Gyroscopes could stabilize the sofa, like the Levitron toy, but they would have to be very large, consume a lot of power, and be rather noisy. Stabilizing with a diamagnet would require a very large, powerful, and impossibly expensive electromagnet. Stabilizing with a superconductor would be easier, but that has its own problems, including the need for cryogenics. For these and other possibilities for stabilization, see my book Rising Force: The Magic of Magnetic Levitation (Harvard, 2011). Hello David. I've tried to contact you by kootouch@mail.com but got no reply. I'm from Brazil and my agency is the communication channel of a large food company. Need to contact you urgent about Cloud Sofa. Get notified for new design release, follow on Twitter!